This 2 minute easy half up half down hairstyle tutorial was sponsored by Mirum. Aside from a brief period in middle school when big bangs stiffened to epic heights with hairspray was all the rage, I’ve never really spent too much time on my hair. 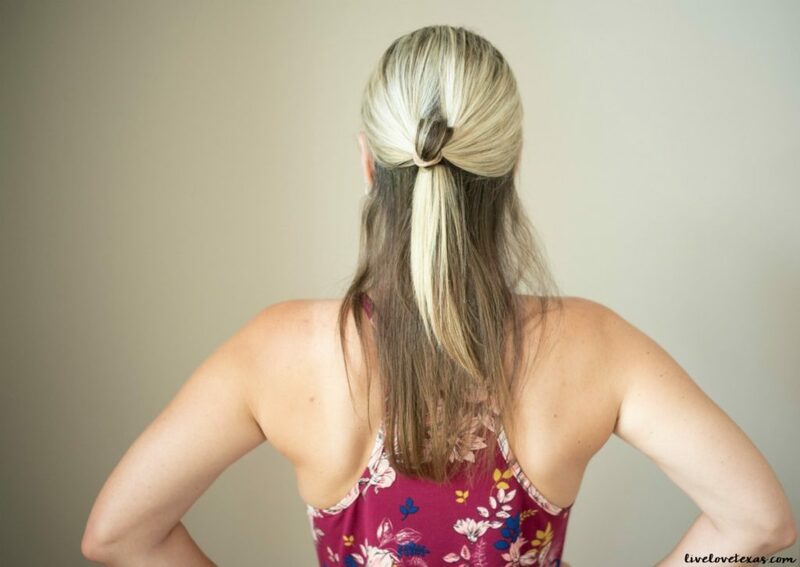 Especially after becoming a mom, I’m all about fast and easy hairstyles. Most days, I alternate wearing my hair down, rocking a high ponytail, or throwing it into a topknot. But with all of the traveling and entertaining we’ve been doing this year, I need to throw in a little variety but don’t have the time or patience to do anything too involved or complicated like beach waves. 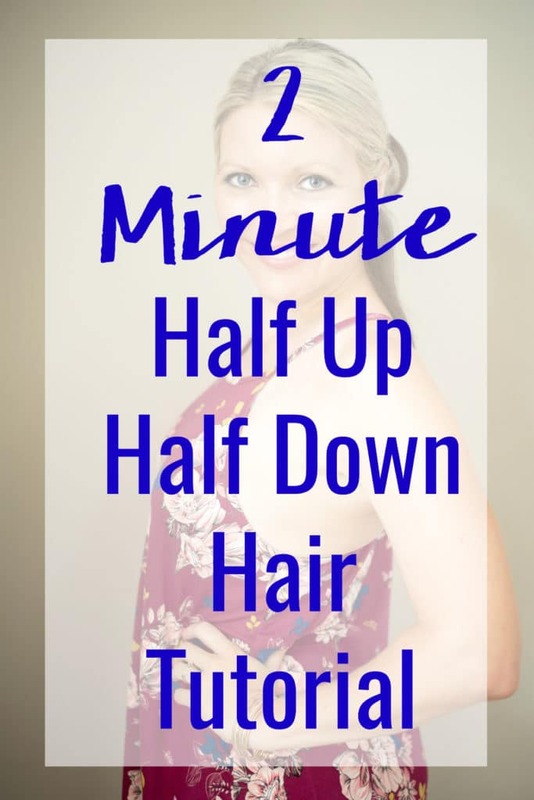 So for those days when you want to look like you put a little more effort into your hair than you actually did, here’s a 2 minute easy half up half down hairstyle tutorial that’ll get you looking put together and fabulous! Step 1: Spray dry shampoo on your roots. 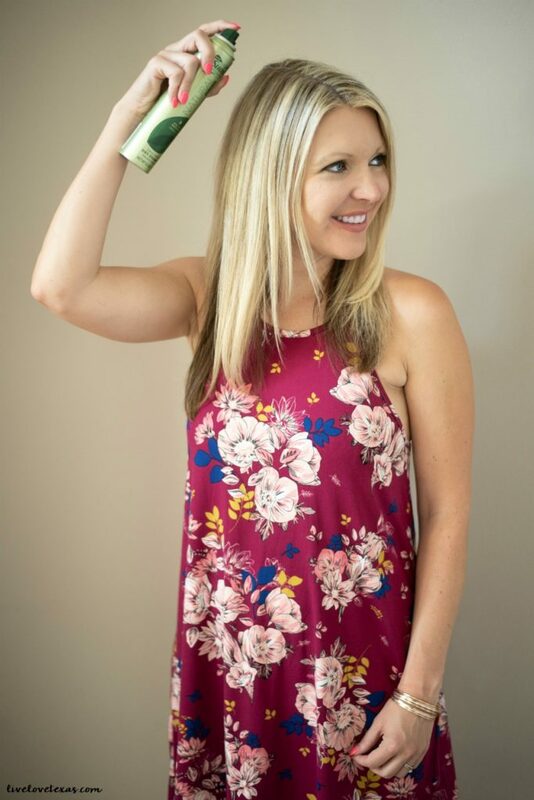 Even with clean hair, I like to add dry shampoo to my roots to prolong the style and help me go a little longer between shampoos which not only helps save me time but also prolongs my color. 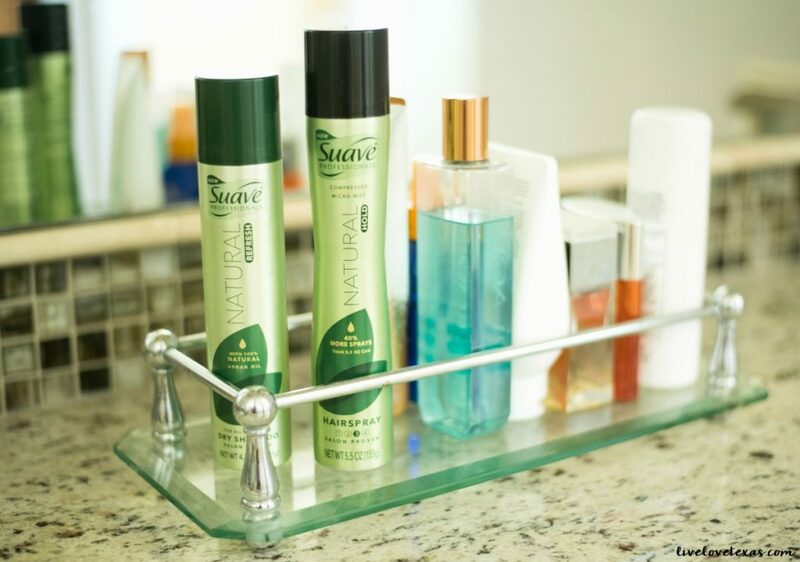 Today I’m using Suave Green Natural Refresh Dry Shampoo which is infused with 100% natural argan oil and refreshes unwashed hair by absorbing oils to provide a natural-looking clean. Plus, it smells great and is such a value, especially right now at Kroger where you can save $1 when you buy 2 products (full details at the bottom of this post). 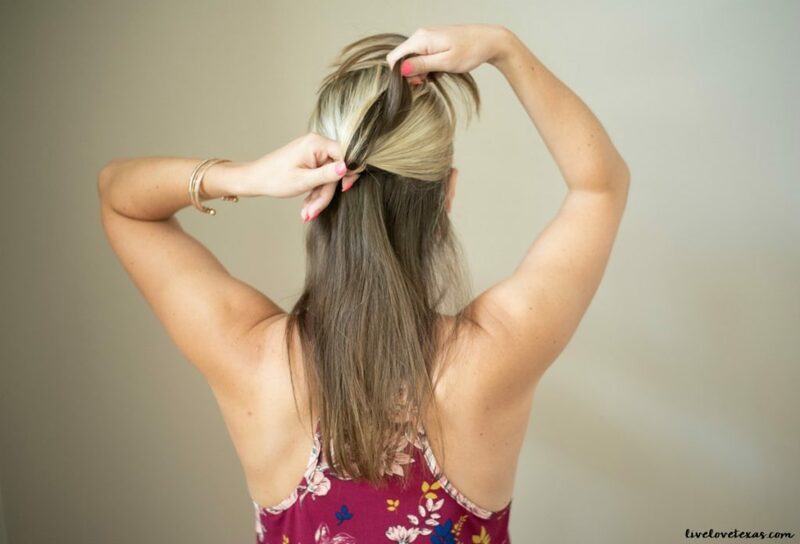 Step 2: Separate your hair into two sections and secure with a hair tie. 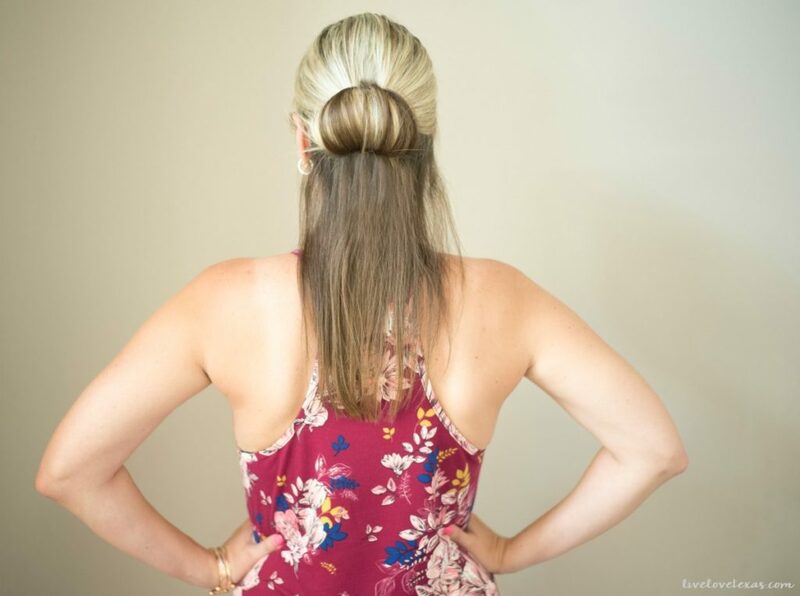 Step 3: Make a hole above your half pony and push your hair through the hole. Step 4: Repeat step 3 but this time fan out your hair to cover the hair tie. For a more polished look, you can add a couple of bobby pins to secure your ends or leave as is for a more casual look. Step 5: Keep your hair smooth but still natural looking by spraying it with Suave Green Natural Hold Compressed Micromist Hairspray. This new hairspray technology goes on light but controls frizz for up to 48 hours, and instead of a sticky feeling immediately feels dry to the touch. 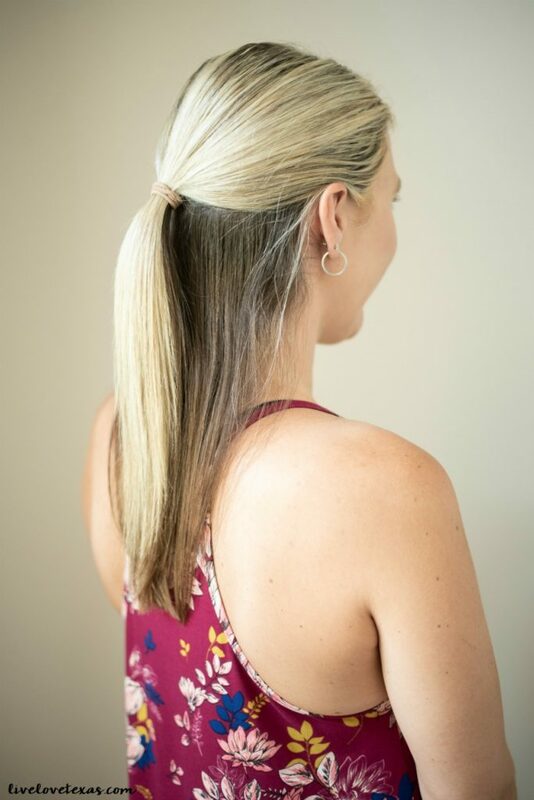 Right now you can save on the products I used in this easy half up half down hairstyle tutorial as well as the entire Suave Suave Professionals, Suave Styling or Hand and Body Lotion line at Kroger! 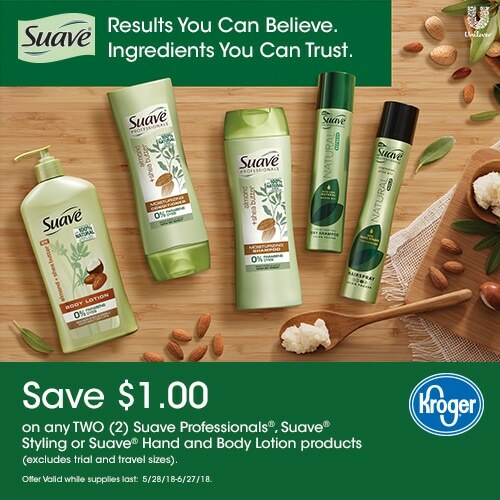 From 5/28/18-6/27/18, save $1.00 on any 2 (excluding trial and travel sizes).